Financial markets in the US will resume trading today for a half day on the day after Thanksgiving. Stocks may rebound slightly on the positive statement from President Donald Trump who said yesterday that he was hopeful of making a deal with China when he meets his Chinese counterpart Xi Jinping at the G20 in Argentina next week. No other major fundamental highlights ahead. US markets were closed for trading yesterday in observance of Thanksgiving Day. Looking ahead, today will be a low volume half a day with the Dow hovering around key technical support level at 24355. 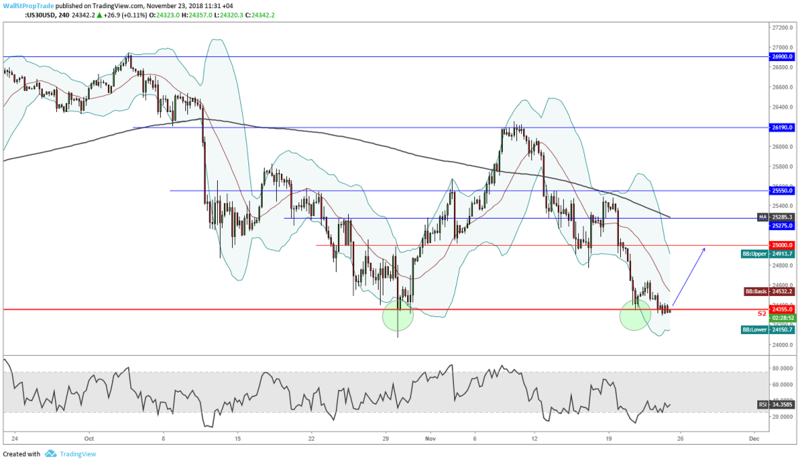 A rally back up from here is highly likely, however, selling could accelerate should prices move below the 24355 level where further sell stops might get activated.